The Mouawad Pink diamond like all other Mouawad eponymous diamonds, gets its name from the internationally renowned jeweler and entrepreneur Robert Mouawad, who is the head of the international jewelry empire Mouawad Jewelers, a name synonymous with exceptional quality, beauty, and excellent craftsmanship in fine jewelry. Robert Mouawad is also a collector and connoisseur of diamonds, having a collection of around 20 famous and historic as well as modern rare diamonds. The Mouawad Pink diamond is a radiant-cut, fancy pink diamond, having a VS-1 clarity and weighing 21.06 carats. The radiant-cut is a combination of the emerald-cut on the top of the diamond and the brilliant-cut on the bottom of the diamond. The combination brings out the brilliance of the brilliant-cut, and shows off the color of the diamond as in emerald-cut diamonds. In terms of size the Mouawad Pink diamond is the smallest of both the Mouawad's collection of diamonds and the Mouawad eponymous diamonds. Yet, the present estimated value of the diamond is over 12 million US dollars. The Mouawad Pink diamond is a Type IIa diamond. These diamonds are nitrogen free or contain undetectable quantities of nitrogen. They constitute 1-2 % of all naturally occurring diamonds. 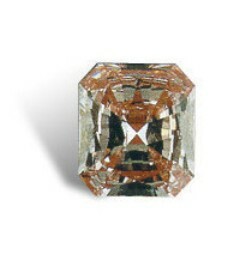 Normally, Type IIa diamonds have a perfectly formed crystal structure, and therefore these diamonds are absolutely colorless. However a small percentage of Type IIa diamonds, probably less than 0.1 %, have crystals that are plastically distorted. These diamonds are no longer colorless, but assume various rare fancy colors, such as pink, red, purple, brown, etc. This is because the deformed areas absorb visible light in different regions of the spectrum, imparting different colors. All information about the diamond is totally lacking except for the characteristics of the diamond, it's current estimated value and the fact that it is part of the impressive collection of diamonds belonging to Robert Mouawad. Mouawad Jewelers was established in 1890, i.e. 117 years ago, in Beirut, Lebanon, by Daoud Mouawad, the grandfather of Robert Mouawad, who had previously learnt the art of jewelry crafting in New York and Mexico. Subsequently the business was inherited by his son Fayes, who made a wise decision by shifting his base of operations to Saudi Arabia, which provided unlimited opportunities for the expansion of his business, and to benefit from the growing affluence of Saudi Arabia and other oil producing countries of the Persian Gulf. Robert Mouawad inherited the business from his father Fayes Mouawad, and was responsible for laying the foundations, to transform the business into a global concern. Under Robert Mouawad's stewardship the business expanded into Europe and later North America and the Far East. Today, Mouawad Jewelers has 16 offices and 8 factories across the globe. Besides this, they have a chain of 16 showrooms in the Middle East and 37 showrooms in Asia, and the company employs over 1,400 workers to man this international network of offices, factories, and showrooms. The Mouawad family had made an enormous contribution for the development of the international gem and jewelry trade. Their donation of 6.8 million dollars to the Gemological Institute of America (G.I.A.) had gone a long way in boosting the activities of the Institute, which included the providing of scholarships to young gemologists from around the world, to study at the Main Campus of the G.I.A. at Carlsbad, California. This campus has been named the Robert Mouawad Campus, in recognition of his generous contribution to the institute. Robert Mouawad took an active part in international diamond auctions from the early 1970s, and began a quest for world renowned historic diamonds in order to begin his own diamond collection. In the course of time his acquisitions included the following historic diamonds :- the Ahmedabad, the Excelsior I, the Indore Pears, the Jubilee, the Queen of Holland, the Tereschenko, and President Vargas. The modern diamonds he acquired included the Premier Rose, the Taylor-Burton, the Star of Abdul Aziz and eight eponymous diamonds bearing his name. It is worthwhile recollecting here the highly philosophical statement about diamonds, made by one of the world's greatest connoisseurs and collectors of diamonds, Robert Mouawad, after reflecting on his amazing diamond collection;"Each diamond is unique and has personality traits, some more appealing than others. The whiteness or fancy color, the size, the clarity, the cut, the immortal character, are all factors that contribute to the overall beauty of a stone. But it is the human touch that unveils it's beauty. In it's rough state it hides it's true potential value. Also the true historical value of a gem from it's formation to it's birth on the earth's surface and the many lives it has affected, are all intangibles that add to it's mystique."